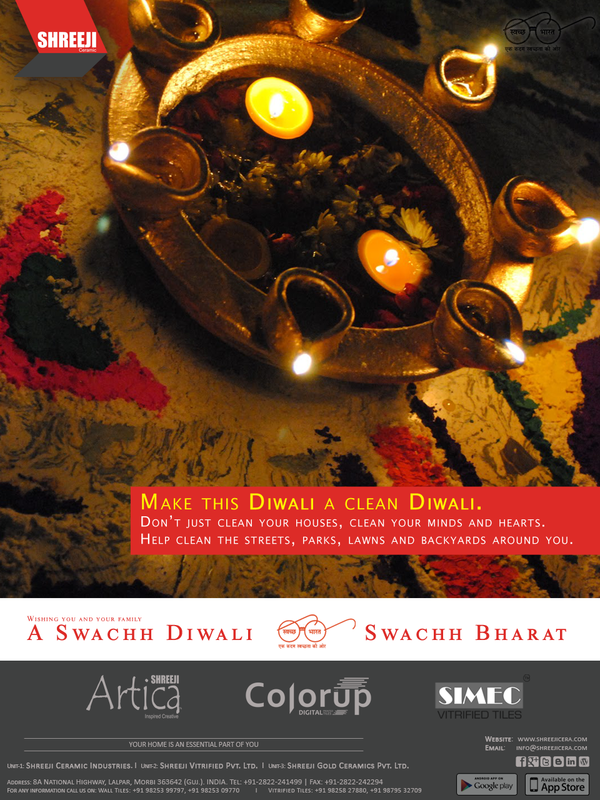 Make this Diwali a #SwachhDiwali. Don’t just clean your houses, clean your minds and hearts and help clean the streets, parks, lawns and backyards around you. Take the #SwachhBharat pledge with a Swachh Mann. 145th Gandhi Jayanti – एक कदम स्वच्छता की और . . .
Mohandas Karamchand Gandhi, Mahatma Gandhi, the apostle of peace and the Father of the nation was born on 2nd October 1869 at Porbandar in Gujarat. He was the epitome of peace, non-violence, truth and duty. His life and his teachings reflect the values of our country and the values of humanity. He played a very significant role as an architect of Indian Independence. He had inclination for cleanliness in his personal habits. Mahatma Gandhi believed that Sanitation is more important than independence. To pay tribute to him on his 145th Birth Anniversary on October 2nd, 2014, our honorable Prime Minister Shri Narendra Modi has launched “Swachh Bharat Abhiyan”. Inspired by Mahatma Gandhi, Swachh Bharat Abhiyan is a mass movement for a change in human attitude towards cleanliness and sanitation and to create a clean India of Gandhiji’s dream by his 150th birth anniversary in 2019. Let us devote some time towards Swachhata (cleanliness) in the memory of the man who attained Swarajya (independence) for our motherland. This pre – Diwali, let’s just not only clean our homes but take initiative to extend our hands to clean our neighbourhood and our country. Together we can make a big difference. Let’s unite hands and pledge to make this mass movement a big success. Let’s make India clean and healthy in all aspects. #ShowyoursTile to whole heartily join the countrywide cleanliness drive. Ek kadam swachhta ki aur. 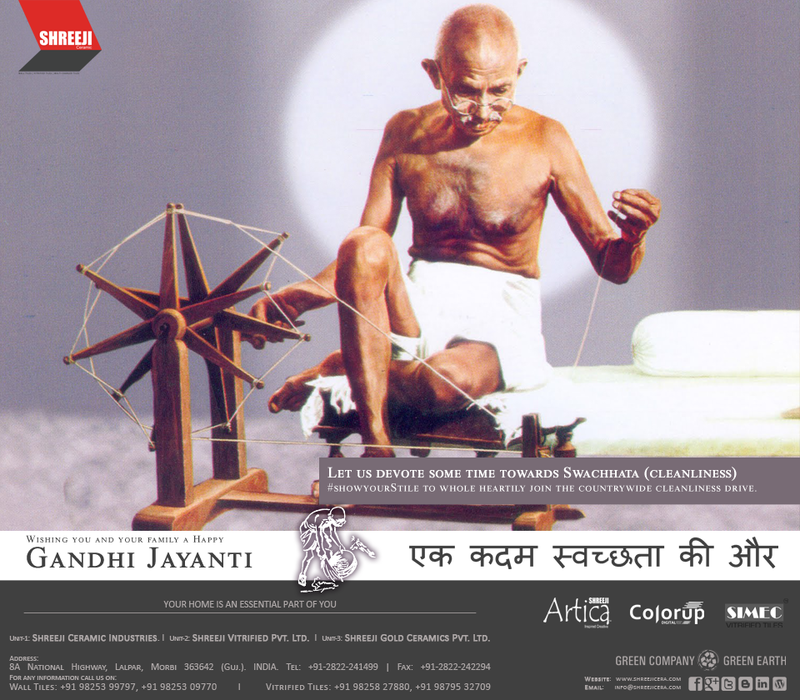 Posted on October 2, 2014 Categories shreeji ceramicLeave a comment on 145th Gandhi Jayanti – एक कदम स्वच्छता की और . . .
Trends in Tiles: What’s new? Tiles have been used for centuries in home finishing and décor. Now, technology has made the possibilities of the design endless in view of different materials, colors and sizes available. Ceramic and Vitrified tiles are commonly used for the bathroom and the kitchen because of its resistance against water and moisture. Our current Trends show that tiles are now applied to more than just living room, kitchen and the bath. Now, tiles have become popular as exterior walkway and garage floors. Moreover, it has also been used in other indoor areas to highlight on bedroom walls and even ceilings. In most of these indoor areas, decorative tiles or those digital printed by Colorup are the preferred choice. Other than different applications, trends have also moved towards different designs and materials. 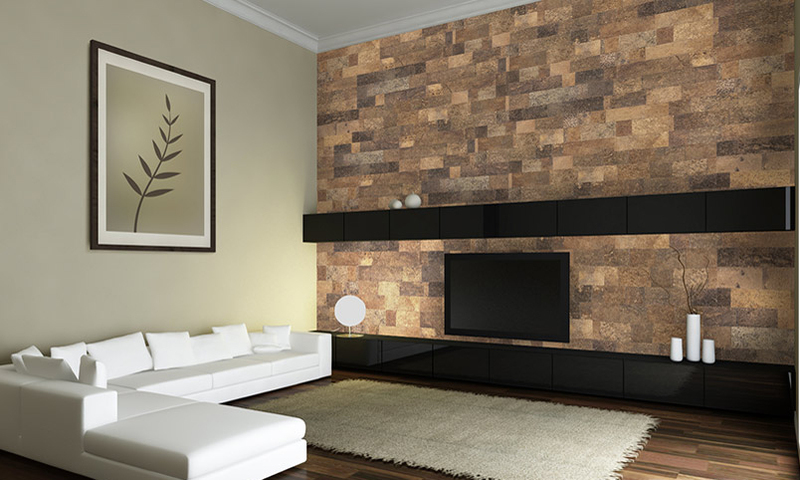 Digitally printed tiles made to like natural stone have become more popular. These tiles tend to look more luxurious and elegant than the common glazed ceramic tiles. Digital printing gives opportunity to have the deeper hues in around 480 ppi. Since these newer type of tiles have infinite designs, many homeowners and designers have also opted to mix them with stone carving and fixed wood furniture. It gives a customized look, especially if applied as mosaic. Due to versatility of tiles and numerous options available, Colorup digital tiles now bring out the creativity in designers and homeowners. Why settle for the ordinary when the best can shine through a complement of colors, materials and application? And despite the advent of new materials and technology improvement, tiles will continue to be used as a unique décor and finish just as it had been centuries ago. Posted on July 28, 2014 Categories shreeji ceramicLeave a comment on Trends in Tiles: What’s new? Shreeji Ceramic, leading player in ceramic tile industry, is excited to announce the launch of its new website as part of rebranding strategy to showcase its products and far-reaching capabilities. The new and improved website handily meets those first two items, and then some! We simplified the top navigation, making it easy and user friendly as well as give clean and speedy access to other useful material such as TileGuide and Company Profile. We will be rolling out new pages and functionality over the coming months, and hope that you enjoy visiting our new website. WordPress posts are also placed prominently in bottom of every page, making it easy to keep up with the latest news and developments in our industry. The new website is visually rich, and as I mentioned earlier, the “under-the-hood” mechanics are easier for us to use, so we can bring you more great content quickly. The website is an essential resource for customers, enabling tile dealers, residential and commercial designers and homeowners alike to directly order samples, contact with our sales team and download our latest catalogues. On this occasion we would like to thanks waywebsolution.com, we really appreciate your help with our website building and smartphone app. It looks astounding, you have a done an amazing job and we are very with it. Our smartphone and tablet visitor appreciated the “responsive design” of our Android and iOS app which were released earlier this year. There will be a major update on-the-air, where you may see all new product viewing experience and search options. Please check for any updates available in your Playstore or AppStore. As we promised earlier, we are continually modifying our online content and keeping you up to date with the latest innovation, product launching or useful information. We will be rolling out new pages and functionality over the coming months, and hope that you enjoy visiting our new website. However, due to significant changes in the website architecture, we know there may be digital hiccups and you may experience virtual road blocks along the way. There is where we need your help! Please email us at info@shreejicera.com if you see a broken link or feel that something should be reviewed or enhanced. We will do our best to perfect your browsing experience. #FifaWorldCup event that decides the best football (or soccer) team on the planet is set to kick off soon. This year football fever on the web is unquestionably stronger than it was in earlier events. 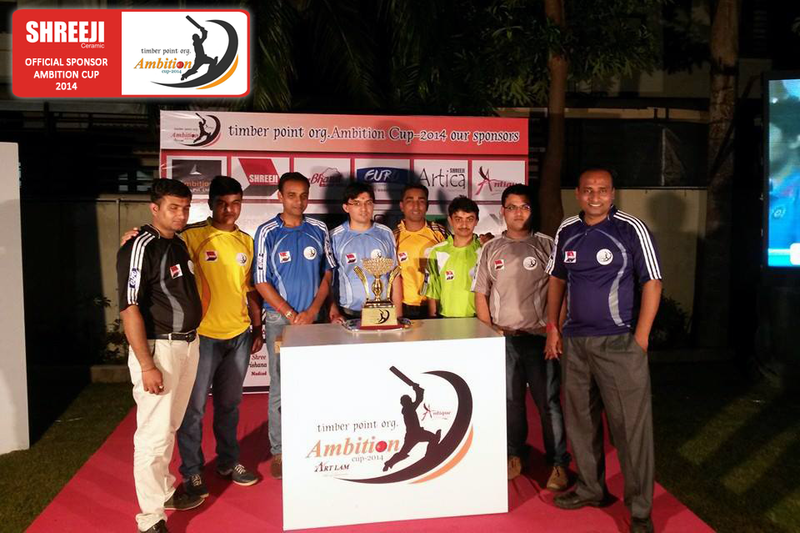 Social media trending about football updates, big brands in market using promotional items to their advantage with smart ads. Football is everywhere and it is the most favourite sport in the world. Our team constantly interact with interior designers and get up-to-date with trending style to know the mood of people. 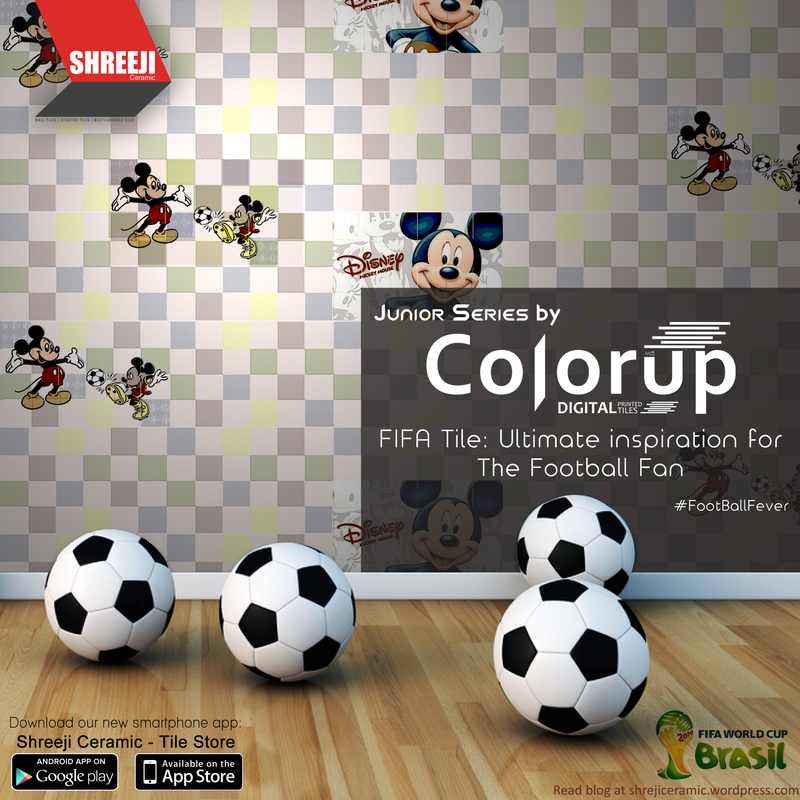 In this football season, our designers are bringing out football related FIFA TILE for walls to attract in our customers who are passionate about the game. Besides, we have over three thousand designs and patterns to choose from in almost all popular shapes, sizes and colors to help you create your own piece of tile art fit for any room of the home so that you can proudly #ShowYourStile to your friends and relatives when they come to your home. Also, we recommend you to view our collection at the comfort of your home. Our smartphone app: “Shreeji Ceramic Tile Store” for iPhone and Android users are available to download for free. We have come a long way from just using plain white ceramic tiles. With colorful stain free floor tiles, digitally printed wall tiles, anti-skid and parking-proof options available, to name a few, the vast array of options is endless and tiles are very often used to make a statement. But now there is a new tile fashion brand ‘COLORUP’ meaning that ceramic tiles are leaving the comfort of the kitchen and bathroom and spreading their wings into every room in the house. Current trend depicts that Tiles are not boring at all. The changeability of them means that they can be used for a number of different projects, in number of different part of house. In last 2 years, Shreeji Ceramic has put its foot forward in digital printing technology for its wall tile collection. Customers are demanding the most trending fashion in ceramic tiles. They are adapting new ways to decorate their home using creative and uniquely designed ceramic tiles. Since digital printing technology launched, home owners’ uses ceramic tiles to create pictures and is fast becoming an increasingly popular way to adding a focal point to a room. Whether that’s using tiles to create a cleanable pictures in a child’s bedroom, or printing personal images onto tiles to create a “custom-made” piece of art. Fashion has no end, and thus we believe in adaptation of fashion trend is the most successful way to deliver our customers with great satisfaction. Shreeji Ceramic collection is the perfect option to look, as it has a wide range of ceramic tiles and polished vitrified tiles which would make your room a great piece of art. Our team constantly interact with interior designers around the nation to know the mood of people, and in our research we have found out that most number of home owners want feature walls to look an imaginative model of graphic arts. Our advice to those people using patterned wallpaper or brightly colored paint on one wall in a room, how about adding a twist and replacing the wallpaper and paint with digitally printed tiles? With the sheer amount of different tiled options available, adding a tiled feature wall could also bring some extra glamour to a room or give extremely clean, modern and contemporary feel. We have over three thousand designs and patterns to choose from in almost all popular shapes, sizes and colors to help you create your own piece of tile art fit for any room of the home so that you can proudly #ShowYourStile to your friends and relatives. Also, we recommend you view our collection at the comfort of your home. Our smartphone app: “Shreeji Ceramic Tile Store” for iPhone and Android users are available to download for free.